Your personal and professional distinctions are THE precursor to closing the deal. Why? Because most salespeople are not distinctive-all they do is follow one another. 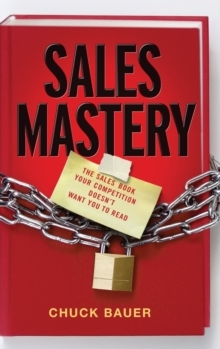 Sales Mastery gives you Chuck Bauer's unique personal experience as a highly successful salesman turned sales coach. You'll connect with his methodology, proven by salespeople in every industry, to distinguish yourself, build your sales skills, and win deals again and again. * Each chapter focuses on one important quality of salesmanship enabling you to actualize your potential as a prosperous seller * Includes tips for mastering sales presentations, phone pitches, customer objections, and closing strategies * Learn how to market yourself shamelessly, close sales according to your clients' dominant personality styles, and make prospects chase you * Author is a nationally recognized sales trainer and coach Sales Mastery gives you the toolset to break away from the pack to be the sales leader you always wanted to be...and reap the bigger commission checks that result!